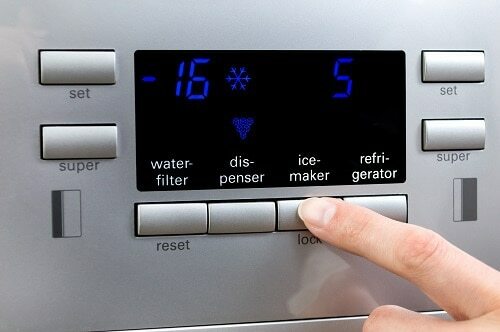 If you’re new to owning a fridge that has a built-in ice maker, you may never have thought about having to clean it. Luckily, this process doesn’t have to be a difficult one. If you follow just a few simple steps, your ice maker will be clean in no time and back to work. Read through these steps one by one, and make sure you follow them carefully and you’ll know exactly what to do. Related: Read our article on the Best Countertop Ice Makers of 2018 - complete with reviews and comparisons! You’ll want to begin by stopping the machine from making any more ice while you clean the machine. 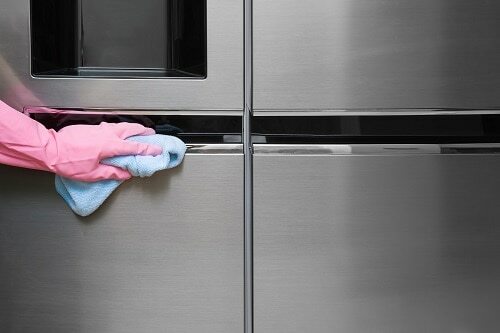 If there is a power button on your fridge that is easy to reach, go ahead and use that to shut the ice maker off. Don’t unplug the fridge unless there is no food inside, or it can get too warm. Otherwise, there is likely to be a power bar that you can lift up to stop the machine from working. Then you’ll be able to start removing parts and getting the ice maker all cleaned out. Be careful to make sure the machine is off before starting! Inside the fridge door, there should be an ice bin. This is where the ice that has been made is typically stored until you press the button to release it. Remove this bin carefully and empty it out into a sink if there is any ice inside. If there are any large chunks of ice that are stuck in the bin, you can run hot water into it to melt them away, or use an ice pick or knife to get rid of them. The next step is going to include actually washing this bin, so you can choose to set it aside for now or do that step next. In this step, you’ll want to fill your sink with hot, soapy water. This is the point where you can take a moment to wash the ice bin and set it aside so that it has time to dry while you work on the machine itself. 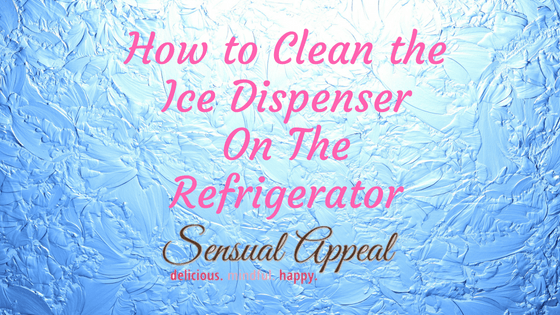 You’ll also want to take a washcloth and use it to rub the ice machine down with the soapy water. After that, wipe it down again with a dry cloth to remove any soap. Make sure it has been washed and thoroughly rinsed off. The next step will be to sanitize the ice maker. You can do this using a gallon of water mixed with about ½ a cup of bleach. Make sure you wear sturdy gloves and try not to allow your skin to come into contact with the bleach. Now, you’ll want to wipe down the machine using a cloth that has been dampened with the bleach water. Make sure you get all the crevices to sanitize the entire area. Then use your dry cloth to wipe away any excess moisture. It’s important to rinse it well. If you have an ice bin that is safe to use in the dishwasher, you can start a sanitizing cycle in your dishwasher with the bin inside. This will make sure it’s also thoroughly cleaned. This can be a much easier way to get it clean, but not all ice bins will be dishwasher friendly. 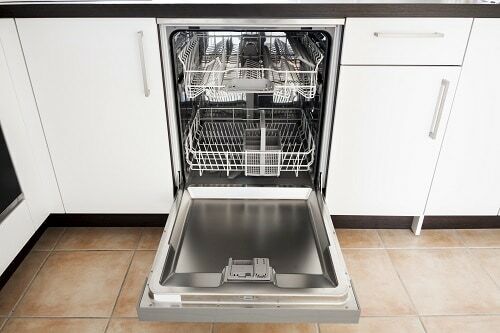 If your bin isn’t safe to use in the dishwasher, you can wipe it down with the bleach mixture as well, or perhaps give it another quick wash with soap. This will just make sure it’s totally clean. Whatever you choose to do, just make sure you dry it completely afterward. Before you finish, it’s a good idea to wipe everything down one last time with a dry cloth. Soap and water or bleach mixtures can freeze if they are left in the machine and potentially wind up getting mixed in with your ice. This can be unpleasant at best, and unsafe at worst. Leaving these mixtures in the machine can also cause problems for it as it works, or it can cause your ice bin to crack. Rather than having to worry about potential damage to either part, it’s better to just give it one last quick wipe down to make sure there won’t be a problem. Finally, get the ice bin placed back into the machine correctly and allow the power bar to lower, turn it back on or plug the fridge back in. Everything at this point should be clean and ready to start making ice again. For the most part, the ice maker in your fridge should only need to be cleaned every 4-6 months or so, but you can certainly make it a monthly thing if you want to. This will of course depend on the kind of use the device experiences as well.